The Senators’ Bargain is the last installment in How Democracy Works Now, a 12-part series on immigration reform since 2001, produced and directed by documentary film-makers Shari Robertson and Michael Camerini. ** Started in the summer of 2001, the original thought was to produce a single film that would trace how an idea—comprehensive immigration reform—becomes a law. GOVERNINGWorks interviewed Ms Robertson and Mr Camerini at the beginning of March. What follows is their unedited written responses to GOVERNINGWorks’s written questions. GOVERNINGWorks (GWorks) Give GWorks the Elevator Pitch. Shari Robertson & Michael Camerini (MCSR) Look, no one has ever done this before: For six years, we followed an idea, and the people struggling to make that idea into the law of the land, through the twists and turns of the American political system. We chased it from private off-limits back rooms in the US Senate to small towns in Kansas, Iowa and Arizona. We ended up with twelve feature length films, each a drama of its own, that together tell this grand single story about how the ‘system’ works. GWorks What is How Democracy Works Now about? MCSR It’s an anatomy lesson, in a way. If you really want an insight into your democracy, take a journey from the inside, experience the life of people engaged in the dance of policy and politics. GWorks Who should be watching this film? We hope to interest both people who think they know (we think they’ll see things differently after they see these films) and those who have given up in disgust (we think they’ll find our protagonists and this story inspiring and hopeful). And seriously, we actually do think the combination of stories and revelations about how the legislative process works are critical understandings for most people, as members of this society. Democracies, whatever you think of that idea, can’t and don’t run very well when citizens are not engaged. GWorks And, what do you want viewers to take away from this film? Shari Robertson (SR) We would like for people who see these films to be haunted by them, to keep on thinking about the characters and the ideas and new impressions, to the point that it changes the way they consume news and deal with the government. And we’d like those same people to feel how possible it would be to have a voice, make an impact on this system, whatever their interest might be. Michael Camerini (MC) The system works, that’s not the problem: We are. Complex problems require complex solutions—and an active citizenry capable of sustained interest in solutions that include compromise and negotiation. GWorks You have extraordinary behind-the-scenes access in How Democracy Works Now. You are in Senate offices, talking to the staffs of the late Senator Kennedy and Senator Sam Brownback (R–KS). You are in strategy sessions with immigration advocates like Frank Sharry, the founder and Executive Director of America’s Voice. Marches. Town Hall meetings. Buses. In one episode, you are riding in a car with former Congressman Tom Tancredo (R–CO6) as he drives to his office on Capitol Hill. How did you get this access? SR Ah, access. It’s the Number One question we get, and as David Neal [Senator Brownback’s Chief Immigration Counsel] says in one of the shows, he’s learned working on Capitol Hill that if you have to explain it, you’ve already lost. But to give it a try: Access starts with permission of one kind or another, usually. It might seem like that’s where it ends, and once you’ve “got it,” you’re in. But really, permission is the barest of warm-up formalities. The real access, the stuff that makes it possible to shoot footage that’s fun to watch and deep, is all about creating relationships. Usually, for better or worse, the ideal access relationship to make a documentary is that of dog to master, with the people being filmed as the masters. When we are doing really well, we’re those people’s dogs—appreciative and interested, but not really very important to the moment at hand and not all that likely to understand it. That’s the relationship we’re going for. We want to be so unobtrusive and most of all so boring that they can completely forget about us; and it helps to be so unconditionally appreciative that they’re glad when we show up. MC Well maybe that’s going too far—the really hard thing is shifting access, being able to follow the story as it moves from one realm to another and to keep being able to film in one way or another. Each link is different—figuring out that each Senate office handles its internal communication differently was key. The connection between Senators [Robert C.] Byrd [D–WV] and Kennedy was different from that of Kennedy and Brownback, and we had to know how to follow the thread in each case. GWorks Were you surprised you got this much access? SR Well, yes and no. Coming out of a film on such a clearly “confidential” topic as political asylum interviews, we were surprised in the beginning to learn how defended these DC people we wanted to film next felt they had to be. Capitol Hill turns out to be a pretty hard place to get behind the scenes, and politicians have whole armies of protectors, in addition to pretty effective danger radar of their own most of the time. (The armies are there for the times when their own radar fails.) So the challenge going in was a shock to us, a bit. Once we decided to give it a real try, though, our years of ‘seeking access’ in lots of other places did help. I think we know that when we make a film, we’re not exactly doing it by ourselves—it’s always some version of a collaboration between us and the people we’re filming, because it only works if they help, they surrender, that’s the only way for anything good to happen in front of the camera. So, we began by explaining what we wanted to do, and asking for their help. Pretty simply. In a lot of cases, that did work, and now that they’re getting finished, it’s just a question of whether they will think that the films we ended up with are good representations of what we set out to do. But in the sense of was the access surprising, not so much when people were in as collaborators. MC But given that we were trying to map/live through the evolution of an idea through the neural network of our democratic system, there was never enough access! We kept on trying to get into new offices, work with new groups throughout the six years. Every documentary is made from what you actually get. Looking at the films you maybe struck by the intimacy we achieved, but there was always someone else we wished we could have filmed with too. But it was just the two of us. So, we did what we could. MCSR Sure, plenty of people. The most elusive people we wanted to film with and didn’t ever really manage to convince were the ones on either far end of the issue. The radicals were very tough. GWorks And, what is it like to be there as the action happened? MC The pleasure comes not in just being there, but dancing well, being able to flow with the action in a realm you don’t know and where you often cannot guess at what comes next. SR Being there to film, after a while, was really a feeling of being part of it—though we never got confused about who was doing it and who was filming. But still, to be in on the action at a level where it was possible at least sometimes to guess what might happen next, and then manage to get into the right spot to film that, was completely consuming. We had to be significantly more analytical about the narrative unfolding in front of us than if we had been on the scene living out our own realities, but the situations we were filming were our reality too. For long stretches, being there to film was all we did. GWorks Is there an event that stands out to you as being particularly illustrative of your experience making How Democracy Works Now? MCSR The truly remarkable thing about the experience was the ability, by filming with several related individuals and organizations all working on the same issue at once, to move among them and by doing that, know more about what was actually happening than any single person could. Even among allies, many secrets are not shared, for all kinds of reasons. But moving around makes all that more visible. And it’s amazing, like dreaming. It poses other problems, but the experience is still phenomenal. GWorks How Democracy Works Now is a series of 12 episodes. HBO will broadcast The Senators’ Bargain starting tomorrow (Wednesday 24 March). The series captures the immigration debate in remarkable detail and from multiple, contrasting perspectives. You started filming in 2001—before 9/11. You shot more than 1400 hours of film over six years. You have been editing for three years. Moreover, this isn’t the first film you have made on immigration. You have been thinking about the issue of immigration for more than 20 years. In 2000, you released Well-Founded Fear, on the asylum process in the United States. Given that you have seen this process close up and have followed the immigration issue for so long, where do you think the immigration issue stands now? SR The real answer to this question is probably the answer to the next one about [How Democracy Works Now], but as for immigration, the issue: a bad thing has happened to the conversation on immigration over the years we’ve been working on the series. It’s gotten polarized to the point where it’s now a toxic one, a third rail for politicians, much like abortion and gun control are. This makes them pretty wary about touching it unless they absolutely have to and even then, only under the safest kind of circumstances, with boatloads of political protection on hand. And that means they will go to great lengths not to touch it. But there’s no fixing “our broken immigration system” without some coordinated legislative action. So unless something changes in this equation, it could stay broken for a very long time. MC Two things have become terribly entwined which are really profoundly different. Simplistic answers to the second question have made the first unanswerable. We hope viewers of this series come to understand they alone can change the deadlock we find ourselves in. GWorks What would you say are the prospects for immigration reform in the future? MCSR The immigration problem is growing all the time, and pressure to do something grows commensurately. But the pressure alone may never overcome the obstacles. For better or for worse, though, there is another factor that probably will, and that factor is demographics. At some point and very likely within this decade, the balance of voters will tip to a point that Latinos wield enough electoral heft to force the issue, and at that point, their voting bloc will also be a prize neither party will want to lose. Opinions about when that will happen do vary. When it does, and even now, immigration is one of the top issues for Latino voters. In addition, a significant part of the opposition to comprehensive immigration reform is made up of older voters. It doesn’t seem to be as toxic an issue for young people, and that may play out as favorable for action in time as well. GWorks Has anyone ever made a film like this about immigration—with this much detail and access? SR Most films about immigration center on stories of people with immigration problems—the refugees or asylum seekers or the people who come here without legal papers and try to manage. Our interest in both asylum seekers and asylum officers, with the asylum process itself as the central character in Well-Founded Fear and now, with the political and legislative process as central in this whole series, is fairly unusual. This kind of approach, with immigration as the connecting thread that allows exploration of many more structures and ideas, is a two-sided sword. Once the word “immigration” is connected to any description of these films, there’s a danger that viewers seeking the more personal, immigrant’s side of story will be confused or disappointed by our films, since they’re shaped as much or more about other aspects. We’ve tried hard to emphasize the How Democracy Works Now side of every title, to make that clearer. But in the end, the films are about both. GWorks The title of this film is How Democracy Works Now. What does the immigration battle you chronicle say about how democracy works now? That’s exactly what we wanted to do, to look at how an idea about a way to address a large social issue would, or even could, make its way to becoming the law of the land. That’s an aspect of democracy at work that’s just not very possible to see unless you are a part of it, and everyone we filmed was indeed that. But none of those people had the privilege we did, of being in a spot both to be there as a part of it AND to see it from such a distance that the large patterns also became visible. That’s the perspective that may have led us to a surprising conclusion about how democracy works (now, anyway): Our system, our democracy, is amazingly good at reflecting back what goes in. Every vote, every dollar, every letter, fax or phone call, has an impact. The biggest “problem” with the way democracy is working right now, it seems to us, is that not enough of us know this or believe it; certainly not enough of us get in there and play. But the problem does not appear to be the exquisitely sensitive system, which in our chronicle, reflects back what goes in, very well. GWorks You have been making documentary films for a long time—more than 30 years. You have made films on an impressive variety of subjects and you have filmed all over the world. Women in India; Baptists in New England and Buddhists in Los Angeles; archeological exploration in Latin America; profiles of visual artists. Before turning your attention to immigration, starting with Well-Founded Fear in 2000, you made These Girls Are Missing, a film about educating girls in East and West Africa. What drives your choice of subject matter? MC Documentaries about ideas, how they live in us and shape our world, are hard to make...so we try. SR I think we both love the challenge of “seeing” a situation, understanding things about it both on the basis of what’s unfolding in the moment and calculating in any prior knowledge that’s usefully brought to bear, and then translating that “sight” to an audience who was never even aware of it happening, probably not even interested. And of course, it’s only fun if the translation works, but that challenge isn’t always met. GWorks Having covered so many different subjects in so many places, why did you turn your attention to immigration in the United States? MC It was a series of accidents. We had been looking for a way to do something about refugees worldwide when a remarkable opportunity opened up—a way in to the political asylum system in the US. That got us started, and that got us a reputation in the field that made funding possible. SR Yes, that’s what happened to make it possible. And I think the reason we were willing or able to take advantage of that opportunity, to give up the attraction of making films about other places, (which we’d both done a fair amount of, both separately and together before we started Well-Founded Fear), was that immigration is the central connector between this country and the rest of the planet. It’s built into the nervous system of the United States of America, but it’s also a piece of our national identity that keeps being renewed. That’s an idea that has kept us engaged for the past dozen years, or so. 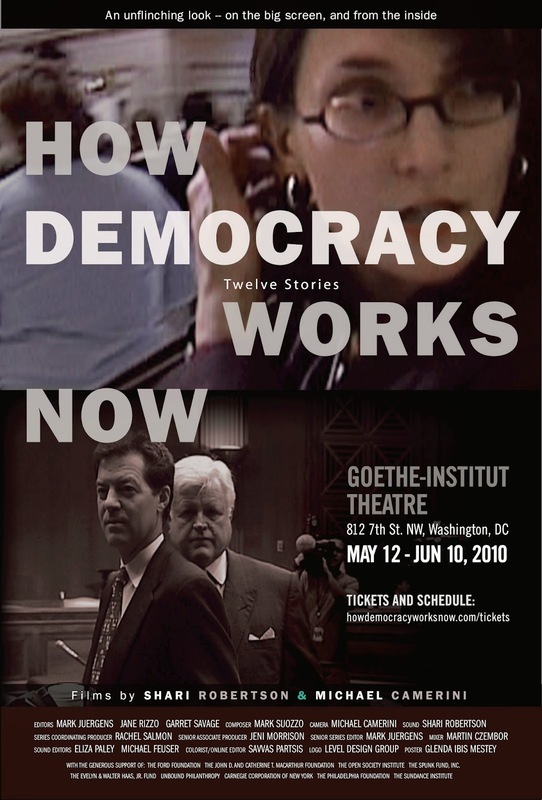 GWorks What thread(s) connect(s) the films you have made to How Democracy Works Now? MC There’s a filmmaking thread, about the question of how do you enter into a world that you don’t know, and learn about it through the experience of filmmaking. And a second one, about learning how to take the traditional documentary practice of making films with small groups of people, and trying to apply the same techniques or aspirations to a much larger realm. That seemed like a fabulous challenge and a continuation of what we’d been doing already. SR I think there’s a continuation, too, of the pleasure of working on an idea that we’ve tackled in many films before—the intersection of individual identity with a wider culture and society—cast in this very new (to us) realm of politics and the huge institutional process of government. GWorks What is the most surprising thing you learned in making this film? MC Right away, something not very profound: how hard they work. Day after day, week after week, Esther just broke us, starting earlier and going on until we could no longer see, much less hold the camera. SR And, how motivated by idealism they were. Even the more political operators, the ones who might be seen as purely opportunistic game-players, were usually—and we’d find this out pretty casually if we got a chance to hang around and spend time with them more deeply—in the game at all for reasons considerably more principled than they’re given credit for having. GWorks Other than a vacation, what is next for Camerini-Robertson? MCSR A film about a village in Turkey that’s at the center of the world, facing East and West. A film about democracy export, that thing we thought we were going to do in 2001. A film that takes less than a year to make. A film shot in one day. To read the GOVERNINGWorks review of The Senators’ Bargain, please visit GWorks Reviews: How Democracy Works Now. * The Senators’ Bargain aired (Wednesday 24 March) at 8PM on HBO2. HBO will make The Senators’ Bargain and two other episodes from How Democracy Works Now available On Demand. For more information on HBO’s broadcast schedule, please visit The Senators’ Bargain at HBO Documentaries. For more information on Shari Robertson, Michael Camerini and How Democracy Works Now, please visit the How Democracy Works Now website. ** I worked with Shari Robertson and Michael Camerini from 1994 to 1996.